What if you could make a difference in your community’s water quality, and the overall environment, by choosing a different product to keep your northeast Ohio property green and healthy? What if the fertilizer used on your grounds actually helped the environment rather than creating toxic runoff that leaches into our water supply, including Lake Erie, where phosphates are triggering the growth of dangerous algae blooms? Schill Grounds Management believes the answer is bio-nutritional fertilizer, a non-toxic, food-grade product that is 100 percent safe for food, pets and water. Caring for our environment is a responsibility we take seriously, and we’re proud to give our northeast Ohio commercial clients the power to make a real difference simply by opting for bio-nutritional fertilizer as opposed to a completely synthetic program. Here’s a by-the-numbers look at the positive impact of a single jug of bio-nutritional fertilizer: For every one jug, we eliminate the use of 45 pounds of nitrates, 10 pounds of phosphates and 37 ounces of concentrated pesticides that would otherwise enter and contaminate our waterways. Here’s how bio-nutritional fertilizer works, why it matters and how you can make a difference on your own property. Bio-nutritional fertilizers are 100 percent organic and promote strong plant health by naturally increasing resistance to disease and insect damage. This is accomplished by encouraging root and cell wall development. Here’s how it works: By adding microbes to the soil, it becomes more balanced. And, a meta-catalyst in the product opens up the plant stomata so nutrients are delivered right to the plant source. This means we can use less product and get better results for your commercial property. At Schill Grounds Management, our goal is to significantly reduce the use of synthetic fertilizers that contribute to waterway pollution. By combining our bio-nutritional product with synthetic fertilizer, we can increase microbial life and organic matter. This brings the soil and plants into balance while minding the use of chemical products. The results are evident on the community spaces and commercial properties that adopt our bio-nutritional fertilizer program. It’s a perfect balance between returning microbial life to the earth while managing weeds, disease and insects in a low-impact way. Why does a hybrid program work? Consider why people buy the Prius car. The vehicle uses less gas, but can still accelerate and perform on highways. Our bio-nutritional program uses less synthetic material but still delivers the professional turf results our clients expect on their northeast Ohio properties. Clean, available water is a limited resource. We all have a responsibility to understand how the products we use and how we dispose of them impact our waterways. 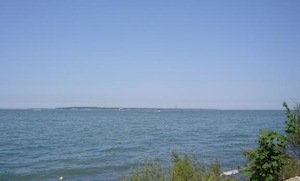 Synthetic fertilizers are blamed for water-quality problems across the country, including in our own Lake Erie, where toxic algae blooms threaten the availability of clean, safe water for drinking, fishing and recreation. Phosphates and nitrates found in synthetic fertilizers run off into our waterways—the chemicals don’t simply disappear. 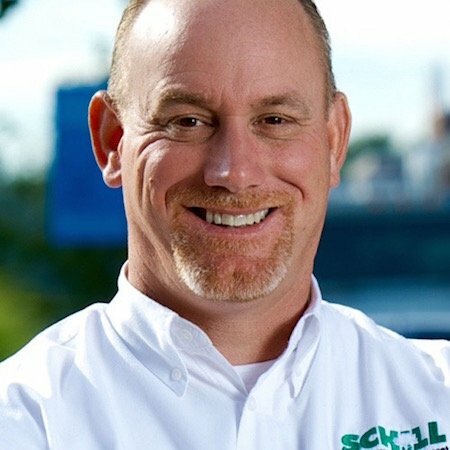 We have a responsibility to use products wisely, and Schill’s commitment to sustainability and bio-nutritional fertilizer program gives clients an opportunity to become a community steward in the effort to protect our Lake Erie. We can make a difference one property at a time by choosing fertilizer programs that reduce the use of synthetic products. Schill’s Greater Green Goal includes a commitment to eliminate 48 pounds of nitrates, 12,000 pounds of phosphates and 45,000 pounds of concentrated pesticides by Earth Day 2015. And we’ll accomplish this one property at a time — one gallon of bio-nutritional fertilizer at a time. It’s a myth that sustainable solutions cost more. With bio-nutritional fertilizer, you can improve the quality of your outdoor environment without increasing the cost. That’s because the hybrid program uses less synthetic product, in combination with 100-percent organic material that actually improves turf health. This reduces the need for weed, disease and insect control over the long-term, which frees up your budget for enhancements or other landscape investments. We’re committed to sustainability and creating a greener northeast Ohio, and world, one property at a time. And, with eco-minded, inventive solutions like bio-nutritional fertilizer, we know our lofty goals are possible. Let’s talk about how you can contribute to the betterment of the community while also improving your landscape’s health and vitality. Give us a call any time at (440) 327-3030 — or fill out our simple contact form — and we’ll get in touch with you!